Uninstall software, get info on them or force uninstall them. Download utilities for disk management, hard disk utilities, software for disk recovery, disk scan, disk wipe, disk management freeware, disk tools for windows. 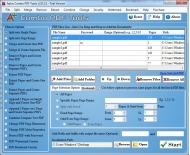 PDF extractor is power software that allows operating PDF file into different way. Application build up with several usual options like split, merge, delete, extract, combine, compare, join, resize, add, append, concatenate, cut, break, remove, delete, edit, modify etc. Tool has option to protect your document from unauthorized user by supporting password security. Using this software you can break up large PDF file into usual pages, join pages and create PDF file, remove blank and corrupt PDF pages, change PDF page size etc. Utility has option to perform operation by using such limitations like specific pages, page range, odd pages and even pages. You can modify Meta properties according to need. * Software fulfills all requirement of user. * Application split large PDF file, merge several pages, delete blank pages, extract usual pages, combine two PDF file, compare two PDF file etc. * Apply conditions like specific page range, specific pages and even/odd pages. * Change Meta properties according to need. * You can change size of upcoming PDF page. * Change paper size, page dimension, page margin etc. * Delete blank and useless pages. * Modify Meta properties like title, author, subject and keyword. * Application runs on Windows operating system like Win Vista, Win XP, Win 7, Win 8, Win NT and more.